Twenty years ago on Tuesday, by my watch, Tim Burton's Batman opened in wide release (the sneak preview was the 22nd) — and opened, by my reckoning, the super-hero era of motion pictures we're still experiencing today. There had been comic-book movies before, of course, going back to the serials — and the the Richard Donner Superman movies introduced comics characters to the blockbuster age of filmmaking. But the bandwagon really doesn't begin moving until June 1989, with Batman's record opening — a time in which the comics shop market is in full flourish, and when Hollywood technology is beginning to open doors thought shut. There are certainly slow periods for comics films after 1989 — but as digital imagery progresses and Marvel untangles its complicated film rights, comics movies become the staple we know today. 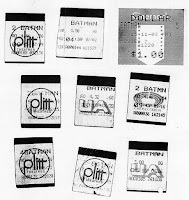 I personally saw the film a dozen times theatrically — those are the stubs at right, and for the curious, here are my reminiscences about that strange exploit, including some thoughts what Batman did for to the comics psyche beyond its value as a film. You can also read Comics Buyer's Guide's contemporaneous reporting of how fans beforehand were indeed very skeptical — and consider the film's box-office success and impact on pop culture in that context. • how much cash comics retailers have on hand. Case #1: Batman (1989). Many people, including most comics fans, were skeptical of this movie before it came out; Beetlejuice didn’t say “Bruce Wayne” to most people. To a degree, Madison Avenue had withheld judgment, too — the result being fewer licensed products on sale in advance of the film in mainstream stores. There were some, to be sure, but for a brief, shining week or so, you could walk by Spencer’s Gifts without seeing Bat-everything — and past there to the comics shop, which had loads of Batman goodies from over the years. Comics shops had the most Batman-related product available to meet the interest in that second half of June — and sales reflected that. A recovery was already underway that summer, following the previous black-and-white collapse — and leading up to the giant bubble market of the early 1990s. But the added attention surely helped the Batman comics franchise, which reeled off a series of hits in the second half of the year. By contrast, when Case #2: Batman Returns (1992) came out, all the mainstream outlets had already been hip-deep in Bat-memorabilia since the month after the first film came out. Warner had a first-tier fast-food licensee this time around in McDonald’s; with the first film, it had been Taco Bell. Case #3: Men in Black (1997), demonstrated that when the mainstream audience doesn’t know characters are from comics, there’s no bounce whatsoever for the hobby. Many hardly remembered Men in Black was from comics — and Marvel itself barely put out a couple of comic books to capitalize on it. In the declining market of that year, any blip would have been noticeable: none was. Case #4: X-Men (2000), might have involved a little of this effect, since the fact that Uncanny X-Men had been the top-selling comic book for nearly two decades was news to the general public. But the bigger problem was that comics shops were at the end of a seven-year recession and had no money to advertise their presence as a place to “read more about it.” The comics recession was worse than the one Batman had opened to, and there were likely fewer shops, to boot. The handout comics at the theater touted Toys ‘R’ Us, not comics shops. Things were so tight that three consecutive stores I visited had ordered no extra shelf copies of X-Men at all the week the movie hit theaters. That’s why Case #5: Spider-Man (2002), comes closer to the mark of a “comics movie that helped the comics.” Most retailers had experienced five consecutive growth quarters by the film’s release, and we, as a community, had the resources to tell the world we existed with Free Comic Book Day, and finance the “last mile” to bring new customers to the shop. The film’s effect on the aftermarket was clearly visible, as well — the outside attention combining with the then-relatively new Comic Guaranty Corp.’s grading services to result in an explosion in Silver Age Spider-Man prices on eBay and elsewhere. Those are some example cases — and there are certainly cases that don’t fit neatly into the formula. It’s not always possible to know whether the movie is really helping, or whether it’s something else. But the lessons from the past seem to be that shops that had related merchandise already in stock and the finances necessary to advertise that fact did best when focusing on films that were recognizable as comics properties in the general culture — yet not so ubiquitous that licensed goods were everywhere. This was only ever a first-cut analysis — and it is, obviously, centered on the direct market. Sales of trade paperbacks in mainstream outlets are certainly another story — and far more likely to be driven by cinematic attention, since they’re already out where the new buyer is. There are also later cases I haven't considered. I am aware that some have done some extensive research into specific box-office performances relative to comics sales, but I haven't seen any of that published. I'll link as they're brought to my attention.